Southern Texas offers a wonderful escape from the harshness of winter up north. Driving an RV to Corpus Christi is the best place in Texas to head to experience some of the mildest weather. Besides beachcombing, you can visit some of the amazing collections within Corpus Christi museums and discover historic sights that intrigue and enlighten. Birders love Corpus Christi! Making your way over to the Padre Island National Seashore means there are miles and miles of coastline where you can study the varied species of birds. The Port Aransas Birding Center is an island sanctuary where you can wander along the boardwalks and view Bitterns, Least Grebes or the unusual Black-bellied Whistling Ducks. To get more viewing in, you can take off on a hike along the Great Texas Coastal Birding Trail. Truly, Corpus Christi is known for its fabulous birding opportunities. On the western shore of Oso Bay, visit Hans A. Suter Wildlife Area. You will find birds as well as wildlife around this tidal pool area. Want to see some marine life while you are here? The Texas State Aquarium is the place for you! You get a glimpse of sea life of the Gulf as well as the beautiful Caribbean and more birds, sea turtles, and sting rays. History of the region is fascinating and you can start out by seeing the aircraft carrier by the name of USS Lexington, a ship that was highly decorated during World War II. Explore and try the new flight simulator so you can pretend you are a jet fighter pilot. More history awaits you at the Christopher Columbus ships: replicas built of these famous sea-going vessels. Britton-Evans Centennial House and Heritage Park should also be added to your itinerary for more historical sites. For those of any age who want a nice break from an active vacation, the South Texas Botanical Gardens & Nature Center is a great spot to relax and calm the mind. See native flora and fauna; take a self-guided tour of all 180 acres. Breathe in those exotic fragrances. The Bird and Butterfly Trail is something you absolutely can’t miss at these gardens. A few more choices in arts, sciences and history! Be sure to stop by the South Texas Institute for the Arts for a view of gorgeous artwork and the Corpus Christi Museum of Science and History for exhibits of archeology, science and natural history. If you are a surfer at heart, you’ll love the Texas Surf Museum with an array of surfing memorabilia. Get back to the water now and drive the Beach Loop. Stop along the way to do some beachcombing and fit in some more bird watching at Indian Point Pier and Bob Hall Pier. This is one winter RV vacation that will go down in your book as one of the best! 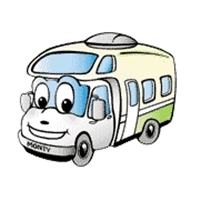 For information on booking an RV Trip in or near Corpus Christi, TX – Click Here or if you need to rent a motor home outside of the state of Texas, CLICK HERE. Picture credits: The picture of the Bird’s Eye View of Corpus Christi is from the Boston Public Library on Flickr Commons. It is licensed under the Creative Commons Attribution license. This entry was posted in Texas RV Camping Vacation. Bookmark the permalink.